NORFOLK, VA. – Norfolk Southern Corporation today announced the regular quarterly dividend of 50 cents per share on its common stock, payable on June 10, to stockholders of record on May 3. Since its inception in 1982, Norfolk Southern has paid dividends on its common stock for 123 consecutive quarters. Norfolk Southern Corporation (NYSE:NSC) is one of the nation’s premier transportation companies. Its Norfolk Southern Railway subsidiary operates approximately 20,000 route miles in 22 states and the District of Columbia, serves every major container port in the eastern United States, and provides efficient connections to other rail carriers. Norfolk Southern operates the most extensive intermodal network in the East and is a major transporter of coal, automotive, and industrial products. The old B&O depot at MP117 Summit Street in Kent caught fire this morning. Likely caused by faulty wiring. Alot of inside damage. CSX probably will remodel it by calling in the bulldozers. Link to news article with pictures. JACKSONVILLE, Fla. - April 16, 2013 - CSX Corporation (NYSE: CSX) today announced first-quarter net earnings of $459 million, or $0.45 per share, versus $449 million, or $0.43 per share, in the same period last year. "CSX continues to create value by supporting its customers with high levels of service in an economy that is still gradually recovering," said Michael J. Ward, chairman, president and chief executive officer. "At the same time, we are prepared for the economy to accelerate and have great confidence in the long-term outlook for the business." Revenue in the quarter was nearly $3.0 billion, essentially flat from the year before, as gains in merchandise, intermodal and other revenue offset declines in the company's coal business. These revenues, combined with strength in operations, drove first-quarter operating income of $875 million, and an operating ratio of 70.4 percent. These results were achieved with industry-leading safety levels. In addition to its quarterly results, CSX announced that its Board of Directors has approved a 7 percent increase in the quarterly dividend on the company's common stock, and a new $1.0 billion share buyback program. "These actions reflect the strength of CSX's core earning power and its confidence in the future," said Ward. "They build upon the $2.3 billion of investment CSX is making this year to meet the nation's future transportation needs and drive long-term shareholder value." Since 2005, CSX has invested $14.2 billion in its business, increased its quarterly cash dividend 11 times representing a 29 percent compounded annual growth rate (including the dividend increase announced today), and repurchased $8.0 billion worth of shares. These actions reflect the company's ongoing commitment to deploy cash in a balanced framework to drive near- and long-term value. The new quarterly dividend of $0.15 is payable on June 14, 2013 to shareholders of record at the close of business on May 31, 2013. The new share buyback program is authorized to begin immediately, and it is expected to be completed over the next 24 months. Under the buyback program, the company may purchase shares from time to time on the open market, through block trading or otherwise. The company expects to fund the repurchase program primarily through excess cash and free cash flow as the company continues to target an improving credit profile. Consistent with its current view of the economy, the changing coal market, and its proven ability to withstand a range of business conditions, CSX said that it now expects to achieve an operating ratio in the high 60s by 2015, while remaining focused on attaining a mid-60s operating ratio longer-term. At the same time, the company expects to produce average annual earnings-per-share growth of 10-15 percent through 2015 off of the 2013 base, which is expected to be flat to down from prior-year levels. CSX executives will conduct a quarterly earnings conference call with the investment community on April 17, 2013, at 8:30 a.m. Eastern time. Investors, media and the public may listen to the conference call by dialing 1-888-327-6279 (888-EARN-CSX) and asking for the CSX earnings call. (Callers outside the U.S., dial 1-773-756-0199). Participants should dial in 10 minutes prior to the call. In conjunction with the call, a live webcast will be accessible and presentation materials will be posted on the company's website at http://investors.csx.com. Following the earnings call, an internet replay of the presentation will be archived on the company website. This information and other statements by the company may contain forward-looking statements within the meaning of the Private Securities Litigation Reform Act with respect to, among other items: projections and estimates of earnings, revenues, margins, volumes, rates, cost-savings, expenses, taxes, liquidity, capital expenditures, dividends, share repurchases or other financial items, statements of management's plans, strategies and objectives for future operations, and management's expectations as to future performance and operations and the time by which objectives will be achieved, statements concerning proposed new services, and statements regarding future economic, industry or market conditions or performance. Forward-looking statements are typically identified by words or phrases such as �will,� �should,� �believe,� �expect,� �anticipate,� �project,� �estimate,� �preliminary� and similar expressions. Forward-looking statements speak only as of the date they are made, and the company undertakes no obligation to update or revise any forward-looking statement. If the company updates any forward-looking statement, no inference should be drawn that the company will make additional updates with respect to that statement or any other forward-looking statements. Back by popular demand for 2013, we will be offering a limited number of Three Bridges Excursions on select dates! Visit us for an approximately two hour round-trip over the entire active BR&W line between Ringoes and Three Bridges, NJ. This is a rare opportunity to ride the BR&W between Flemington and Three Bridges, a section of the railroad that is usually freight-only. Light refreshments will be available for sale (cash only) on board the train. Seating is limited - reservations required! May 25, May 26, August 31 An approximately two hour round-trip over the entire active BR&W line between Ringoes and Three Bridges, NJ. This is a rare opportunity to ride the BR&W between Flemington and Three Bridges, a section of the railroad that is usually freight-only. Light refreshments will be available for sale (cash only) on board the train. This train boards at Ringoes only. Tickets are by reservation only, and seating is limited! A few years ago, the BRRHT took ownership of former CNJ Coach #1009 from Steamtown National Historic Site in Scranton, PA. 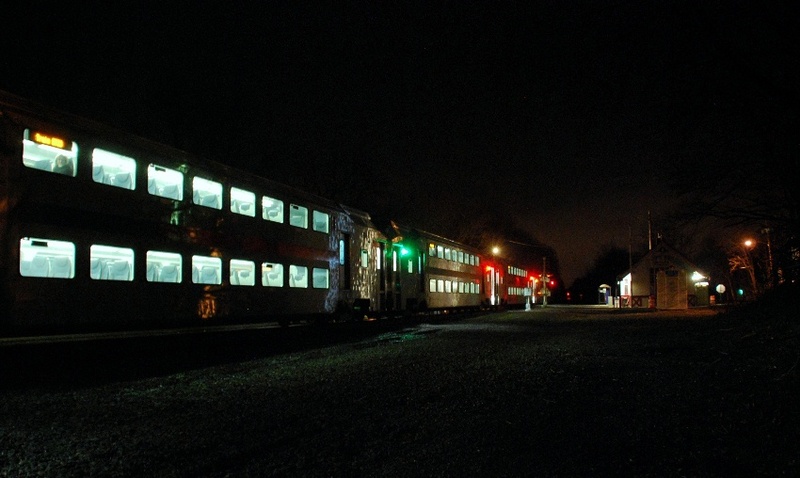 In August 2010 the coach arrived at its new home on the Black River & Western Railroad in Ringoes, NJ. Normally don't send out links like this, but... This is our announcement to the world of our recent acquisition and it's impending restoration to running condition in it's original gondola configuration. These cars ran with white clay from the mines on the Chestnut Ridge to the Cement plants in Northampton to make the World Famous White Cement. I hope you at least read our request and hopefully make a contribution to the cause. Major flooding is forecast for several river gauge locations along the Mississippi River in Iowa, Illinois, and Missouri, and we anticipate the curtailment of traffic moving over Hannibal Bridge early Friday morning, April 19, 2013. Norfolk Southern is using alternate routes around areas of flooding, but customers may see delays of 24 to 48 hours. 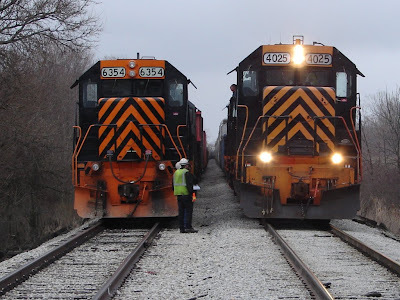 On Friday (4-12-13), railroad photographer friend Ken Heyl recorded this pair of Wheeling and Lake Erie Railway westbound freights stopped for crew change at the Chenango Road South grade crossing, just east of the Village of New London, Ohio. It was a grubby day for photography in Huron County, but I am glad that Ken ventured out, anyway, and recorded this neat Wheeling image. drove up to New London, Ohio yesterday and caught some W&LE RR action. In this photo we witness W&LE #6354 and W&LE #4025 (both westbound) as they meet east of New London for a crew change at Chenango Road. Both trains were long mixed freights. The email also contained a link to the following article and photo from Railway Age for 3-25-13. In 1939, the Florida East Coast Railway and the Atlantic Coast Line premiered new streamlined passenger trains featuring striking art-deco-style paint schemes applied to the recently introduced EMD E3A diesel-electric locomotive. 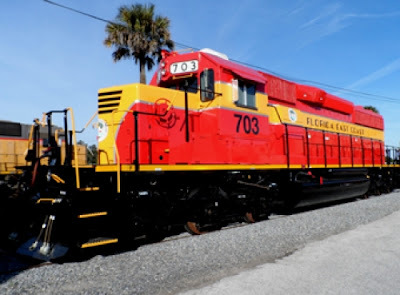 E3A 1001, FEC’s first diesel, was assigned to the Jacksonville-Miami Henry M. Flagler. Sister unit 1002, along with two Atlantic Coast Line E3As, 500 and 501, was assigned to the daily New York-Miami Champion, which had its inaugural run on Dec. 1, 1939. The FEC units wore a bright red, yellow, and silver scheme; the ACL units featured that road's purple and silver livery. Each unit pulled an identical consist of seven cars, with two sets owned by each railroad. The Champion competed with the Seaboard Air Line’s Silver Star and Silver Meteor in New York-Florida service. FEC is reviving the Champion’s livery by applying it to four freight units. FEC 714, completed in 2011, was the first locomotive to highlight the Heritage paint scheme. Recently delivered FEC 703 (pictured) is the first of three locomotives to be refurbished in 2013 by Progress Rail’s (a division of Caterpillar, Inc.) rebuild facility in Patterson, Ga., with a matching Heritage paint scheme. Received the link below via email. 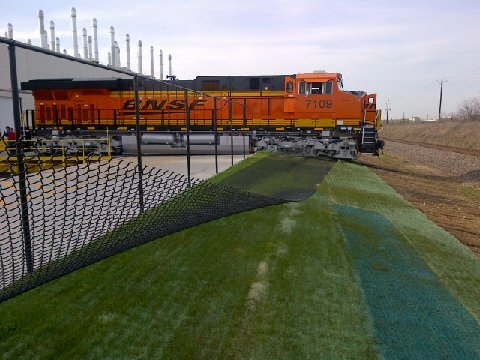 Article is about a special rail car used to deliver live fish from the hatcheries to the waterways. NORFOLK, VA. -- Norfolk Southern Corporation has earned the 2012 National Achievement Award from Transportation Community Awareness and Emergency Response (TRANSCAER®) for its efforts to help communities prepare for and respond to possible hazardous materials transportation incidents. This is the 13th time Norfolk Southern has received the award. NS was one of 10 transportation and chemical companies recognized. NS’ Bill Oertly, hazardous materials compliance officer, Roanoke, Va., won the TRANSCAER® Torch Award in recognition of lifetime achievement. Norfolk Southern supports communities across its rail system by training fire and police departments and rescue and emergency medical organizations about rail safety precautions, railroad operations, initial-response procedures, and rail equipment through classroom training, hands-on activities, and table-top exercises as well as full-scale drills that include use of rail equipment to simulate hypothetical responses to emergency situations. 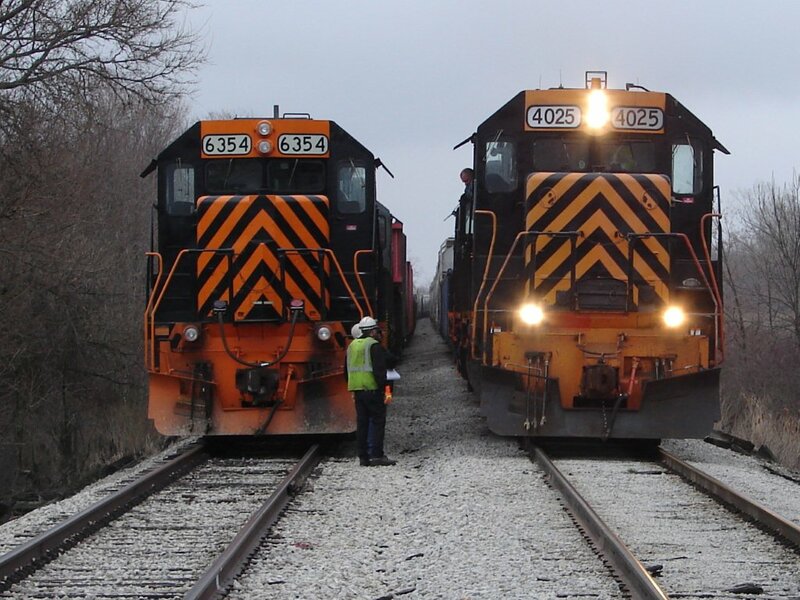 In 2012, Norfolk Southern provided more than 19,000 hours of rail accident response training to more than 5,000 emergency responders. NS also conducted railroad operations classes for FBI agents and railroad liaison agents from the National Joint Terrorism Task Force operated by the FBI, and participated in four drills for local, state, and federal agencies. 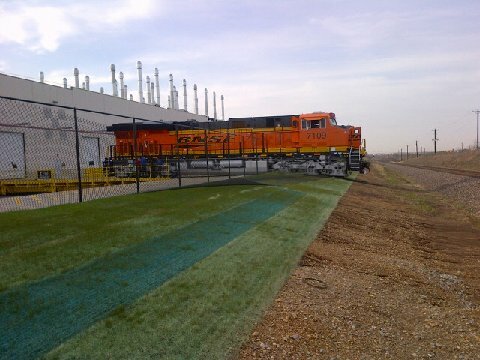 In addition, the railroad has ongoing programs to sponsor emergency responders to attend intensive training courses at the Security and Emergency Response Training Center at the AAR Transportation Technology Center Inc., in Pueblo, Colo.
“Norfolk Southern and its employees are unparalleled in their commitment to providing training to support first responders from across our rail network,” said David Julian, NS vice president safety and environmental. “Norfolk Southern places great importance on these proactive efforts to enhance the preparedness of communities and their emergency management agencies. In the unlikely event of an incident, TRANSCAER® training programs ensure that shared knowledge, mutual areas of expertise, and a wealth of resources can be leveraged to protect the communities we serve,” added NS System Director Environmental Protection Richard Russell. TRANSCAER ® is a voluntary national outreach effort that focuses on assisting communities prepare for and respond to possible hazardous material transportation incidents. TRANSCAER® members include volunteer representatives from the chemical manufacturing, transportation, distribution, and emergency response industries, as well as the government. Received a note with the following link via email. Check out Republic Steel Corporation's Warren, Ohio, blast furnace under construction, interior. Reveived the following via email. This coming Friday night, April 12th, the New York Chapter of the Railway & Locomotive Historical Society will be showing several films having to do with the CNJ. I would like to extend an invitation to anyone on this list who would like to attend. The first film we'll see is a remastered version of "The Big Little Railroad," a promotional film produced almost sixty-five years ago by Jersey Central. There will also be a film shown about the famous Ashley Planes and one about the 'new' Newark Bay Drawbridge. I believe the Bay bridge film was shot at the time the bridge was put in service in the mid-1920s. This program is part of the NY Chapter's regularly scheduled monthly meeting and is being presented by Chapter Director Jim Guthrie. The meeting will be held at NYRRE Williamson Library in Grand Central Terminal, New York City. NYRRE Williamson is in the southeast corner of the terminal, on the first floor, above Vanderbilt Hall. Access is by elevator at the northeast corner of the concourse. Because of security at Grand Central we assemble as a group at the Track 23 gate between 6:45 P.M. and 7:00 P.M. and are escorted to NYRRE Williamson by a Metro-North employee. Meetings normally last to about 9 PM. There is no admission charge. I hope some of the CNJ fans on this list will attend. The Williamson Library has been refurbished and is in itself worth a visit. This morning our blog counter passed a significant milestone: 100,000. That's 100,000 page views since 1/1/07. Thanks to all our visitors, and please keep coming back. Children under the age of 12 are FREE but must be accompanied by an adult. 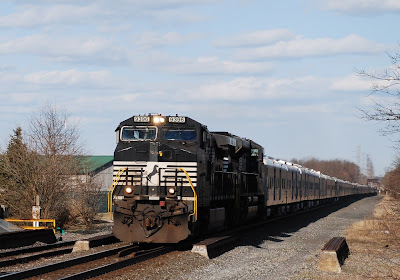 ... is seen passing through Manville (NJ) over NS's Lehigh Line on its 534 mile journey to Youngstown, Ohio on April 2nd after closing out their engagement in Brooklyn's Barclay Center on April 1st. The Red Unit's consist was made up of fifty-nine cars, measuring 5,235 feet and weighed in at 4,290 tons. Don't know if that tonnage included the elephant's trunks! There was to be two crew changes, one in Harrisburg (PA), a second one in Pittsburgh (PA) before this train arrived in Youngstown sometime on Wednesday afternoon (April 3rd). Motive power for this move was provided by NS 9396 (C40-9W) and NS 2653 (SD70M-2). NORFOLK, VA. – Tom W. Schnautz has been appointed assistant vice president research and advanced technology for Norfolk Southern. He has assumed some of the responsibilities of Gerhard Thelen, including positive train control and research. Thelen retired March 31 as vice president operations planning and support. 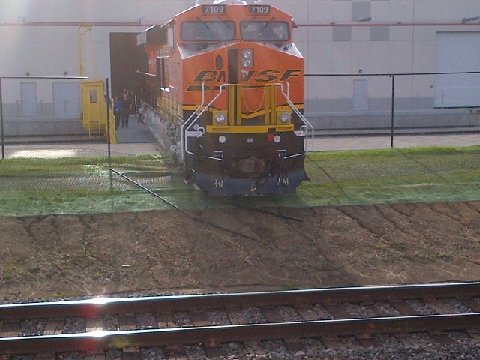 Schnautz joined Norfolk Southern in 1993 as a management trainee in the Engineering department. He progressed through a variety of engineering positions and most recently was director advanced train control until his appointment to his present position. He holds a bachelor’s degree in electrical engineering from Penn State University. Thelen began his railroad career as manager quality control materials for Conrail in 1977. He held several positions of increasing responsibility in mechanical engineering, quality assurance, and engineering before joining Norfolk Southern in 1998 as assistant vice president research and tests. He became vice president mechanical in 2004 and vice president operations planning and support in 2006. A native of Weiler, Germany, Thelen is a graduate of Fachhochschule, Munich, and holds a master of engineering degree from Penn State University. Received this via email back in January and then lost it. 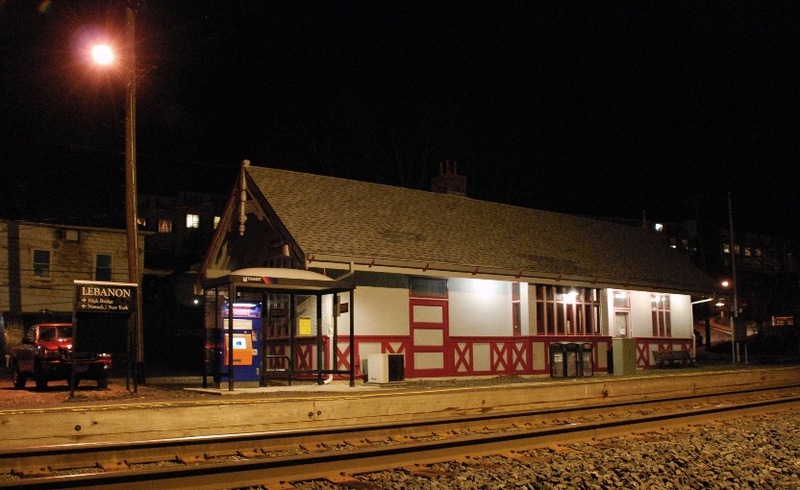 NJT's Train 5733 arrives on time at 6:05 PM for its scheduled stop at the Lebanon Station on January 17th. Located at MP 48.0 on the Raritan Valley Line, it was erected in 1900 by the CNJ for use as a passenger station. In 1968 the High Iron Company purchased the building and land to use as their headquarters. Judging from its appearance, it has weathered the years very well. We cordially invite you to join us on Tuesday, April 23, 2013, at 4:30 p.m. EDT to review our first-quarter 2013 results. We will issue earnings results shortly after market close on April 23. For those interested in participating, we will broadcast via teleconference that will be available by dialing 877-869-3847 several minutes prior to the start of the call. At the conclusion, you may listen to an audio replay, which will be available until April 30, 2013. The replay number is 877-660-6853 and access code 411563. In conjunction with the call, a live webcast will be accessible and presentation materials will be posted on the company's website at www.nscorp.com under the Investors section. Following the earnings call, an Internet replay of the presentation will be archived on the company’s website. In addition, the replay will be available for download to a portable audio player or computer as a MP3 - or podcast - file. Both the replay and MP3 file can be found at www.nscorp.com in the Investors section. Following is a press release from the Railroad Museum of Long Island. On Thursday, March 14, 2013 - Mr. Linn Moedinger, President of the Strasburg Rail Road Company, Railroad Museum of Long Island President, Don Fisher and Vice President and Counsel Dennis DeAngelis, signed an agreement to restore and OPERATE the LIRR G5s Steam Locomotive #39! 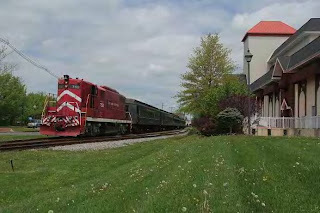 RMLI’s Board of Trustees voted unanimously on Tuesday, March 12, 2013 to partner with the Strasburg Rail Road Company. The agreement culminates five and one half months of talks and negotiations between the two principals. Terms of the contract provide for the Railroad Museum of Long Island to raise $900,000.00 in FY 2013 and transport the G5s locomotive to the Strasburg property, the Strasburg Rail Road will add $1,086,861.00 to the project, complete restoration of the steam engine in three years and then operate the locomotive on their property for a period of forty-eight years. The Railroad Museum of Long Island officially begins efforts to raise $1,000,000.00 for the move and restoration of the locomotive today. Tax-deductible donations may be made to “RMLI Engine 39” at P.O. Box 726, Greenport NY 11944-0726. The Railroad Museum of Long Island (the Museum), was founded in 1990. The Museum is chartered by the Board of Regents of the State of New York, and is an IRS 501(c)3 non profit organization. The Museum is run by a Board of Trustees made up of members throughout Long Island. The goal of the Museum is to preserve and display Long Island’s railroad heritage. All of the work of the Museum is done by volunteers. The Museum operates two locations; Greenport, NY at 440 Fourth Street by the tracks and Riverhead, NY at 416 Griffing Avenue just north of the tracks.